This post was sponsored by the Crock-Pot® brand. Thank you for supporting the brands that support this blog! Alright, guys, I have something so good for you today! A Thanksgiving side dish that you can make in your Crock-Pot® slow cooker to save yourself some oven math. You know what oven math is, right? It’s when you have 7 9×13 dishes that need to be baked in a single oven, all baking at varying temperatures and times. That is oven math. I am here to help you out with that equation and bring things down to a reasonable 6 dishes. Let’s great creative in the kitchen, save some oven space, and also make a traditional casserole even more delicious by slow cooking it! So, I am super obsessed with sweet potato casserole. Like, it’s my life. My aunt made a version of Ruth Chris’ sweet potato casserole for Thanksgiving years ago and since then I have been hooked. I make it at least a few times a year around the holidays. In fact, I’ve been known to eat it on my dinner plate, with my turkey, and then turn around and also have a scoop for dessert. It’s versatile, is what I’m saying. And also sweet. But in a good way. I think you guys are just going to love this recipe! 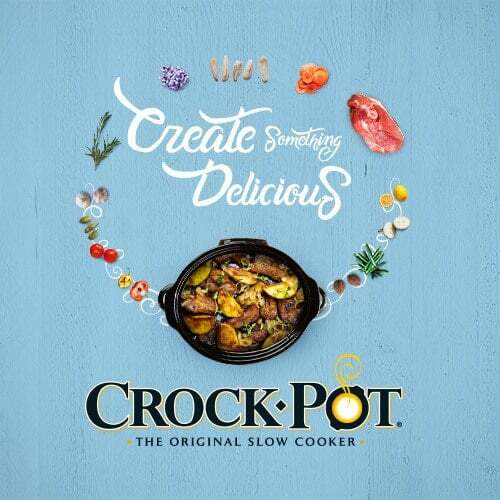 So, I’m working with the Crock-Pot® brand this year to bring you some slow cooker recipes to add to your arsenal. Did you happen to spot my honey chipotle meatball recipe on their site last month? It’s perfect for game day! 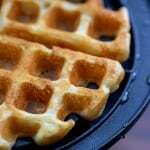 For that recipe and lots more, click here! I’m really happy with my Crock-P0t® slow cooker. It’s the perfect size, heats evenly, and my food always turns out moist and delicious. This sweet potato casserole is everything you want for Thanksgiving dinner. 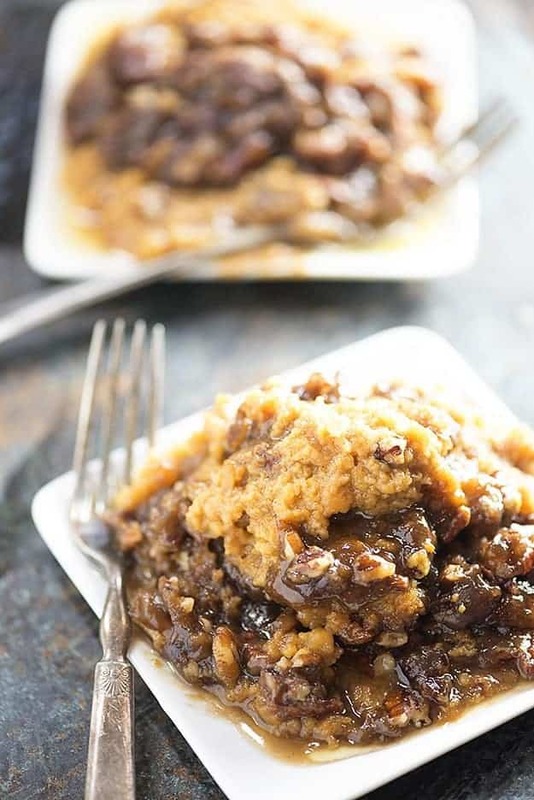 It has that earthy flavor from the sweet potatoes, it’s a quick option so you’re not slaving away on a side dish all day, and it’s full of warm fall flavors, like maple syrup, brown sugar, and pecans. 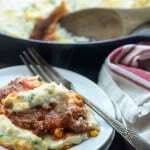 I hope you’ll give this recipe a try and let me know what you think! 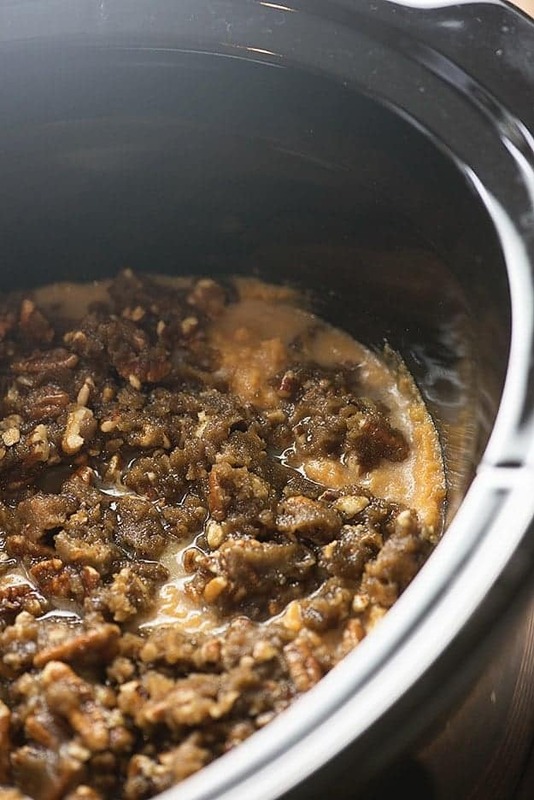 Tell me, what are you planning on making in your Crock-Pot® Slow Cooker this holiday season? 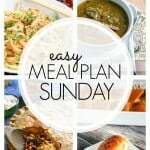 Any recipes I need to try from you? Save the oven space for the turkey! 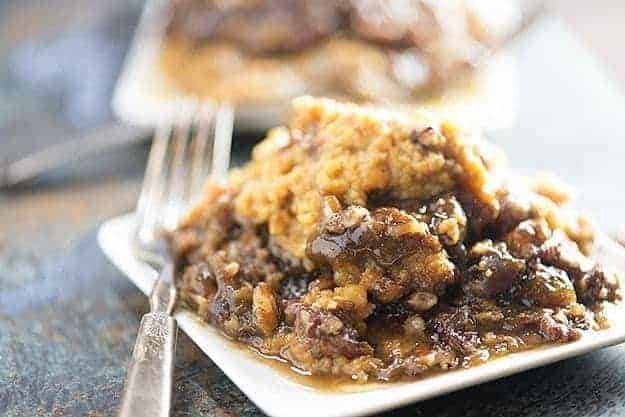 This sweet potato casserole is made in your slow cooker and it's absolute side dish perfection! Oh wow Karly, that topping…. I’d be eating this for dinner AND dessert. I love that it’s prepped ahead and not taking up oven space while I’m making turkey dinner! 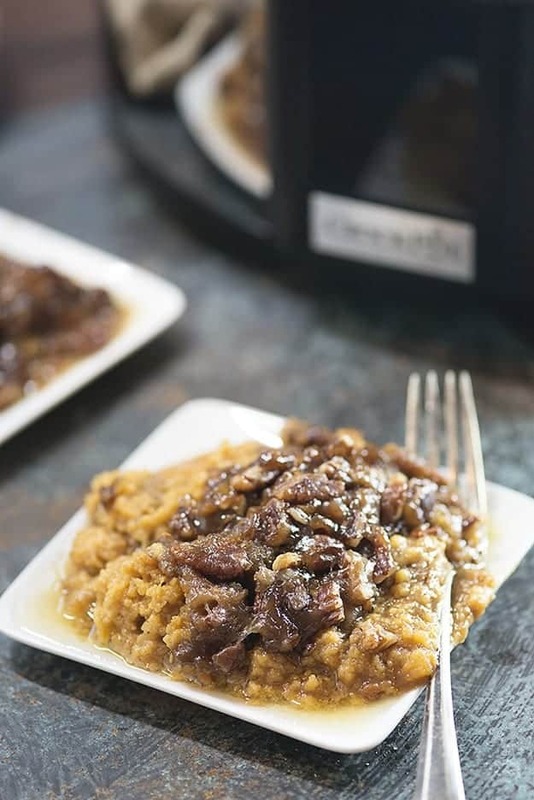 Ohhhh I just LOVE sweet potato casserole… preparing it in the Crock Pot makes it even better! This looks amazing! 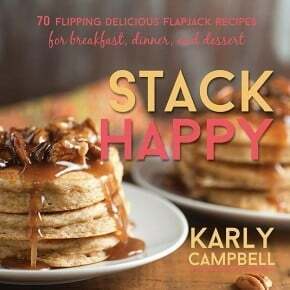 You had me at maple syrup….this looks amazing! With all the crock pot recipes I want to make this T day I’m going to need to buy like 3 more. haha! Oh.my.gosh. I really don’t have any words for how amazing that looks! We make our mashed potatoes ahead in the crock pot. 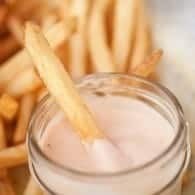 They get really creamy. This recipe sounds good, I would probably start with fresh sliced sweet potatoes and increase my cooking time. I’ve never tried regular mashed potatoes in the slow cooker! Great idea! I could eat this at any time of the year as I’m sweet potato obsessed! What a great way to free up oven space for the holiday! Delicious! PLEASE PLEASE PLEASE buy fresh sweet potatoes!! I put a large sheet of heavy duty foil over the top oven rack then put as many taters as possible on it. Try to get them all about the same size, rinse them and stab them all over with a fork. Bake at 350* for about an hour~check for doneness by stabbing with a sharp knife, if the knife slips off easily they’re done. If not leave them in a bit longer. When done let cool til you can handle them without burning your hands. Slip peels off, put in a large bowl and cut in chunks or mash, then go on with your recipe. By baking an oven full you can bag the extras for later without any hassle. Mixing yams~ the lighter ones~ sweet potatoes~darker ones and WHITE sweet potatoes~ yep, white sweet potatoes, gives a great taste that isn’t overly sweet. ALSO, when bagging sweet potatoes for the freezer smash the bags flat, it saves space in the freezer. I’m going to try your way of baking them too! 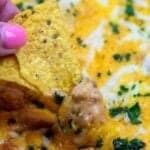 I wonder how many you would need to make this casserole? I love sweet potatoes and always have them around. Since I cook for only myself, I cook my sweet potatoes in the microwave just like I would a regular potato. Last Thanksgiving, I made sweet potato casserole for a family gathering; I cooked 4 pounds at one time in my microwave, let cool until I could handle them, them proceeded as you say. It worked perfectly, even for that quantity. For my usual eating, I just cut them open and add butter, sometimes also adding a sprinkle of brown sugar and cinnamon. I will be trying this!!!! I am always using oven math on Thanksgiving morning. This looks heavenly. I love this type of casserole, saving it for Thanksgiving. I love holiday side dishes that look like desserts! Boy does this sweet potato casserole look heavenly. I love your idea of having one serving with my dinner and another scoop next to my slice of pie! And so easy made in the crock pot. Wow does this look good, and I love the idea of using a crock pot to save on oven space on Thanksgiving! We love sweet potato casserole too! 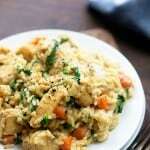 love that this is done in the slow cooker! I never have enough space in my oven! Oooo I LOVE my Crockpot! Holiday side dishes from the Crockpot are absolutely a necessity — that turkey takes out way too much space! 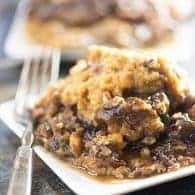 I was always good at math in school, but oven math stumps me every time 😉 Love that this sweet potato casserole can go right in my slow cooker and take the stress away. And it looks so delicious!! This is very similar to my recipe. The only thing is I make double this. this is about the only thing I cook so it is always my go to dish for the holidays. This looks and sounds awesome! 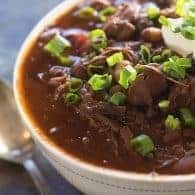 I love that you made it in your slow cooker, thus saving on oven space. And that topping, mmm! ways loved sweet potatoes but never found a good recipe for a good casserole dish. Now I think I have one. Thank you! Hope this is the one for you! Ohmigosh. This looks so crazy tasty1 I know what you mean about “oven math” – it can make things so complicated 😀 This is a great way to save on that precious oven space for sure! I can’t wait to try it! I made this last Saturday, I wanted to practice before Thanksgiving. It was yummy! 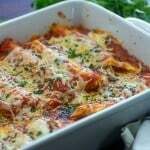 I want to try this but for 20 people (work function and no oven their) so doubling a similar recipe. 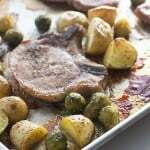 What would you recommend for cook time with the doubled recipe? Hi Karly! I was wondering..can you also cook this in the oven? I don’t have canned sweet potatoes. Should I cook the fresh sweet potatoes first or will it work useing fresh from the beginning? You’ll want to cook the potatoes first. You could cook them until soft in the slow cooker and then mash and add the other ingredients if you like. 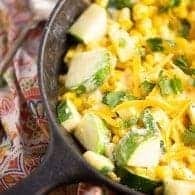 I want to make this for a potluck, can I double the recipe and will it cook in the three hours, or do I need longer. Also will doubling fit in a 5 quart crockpot or better off with just doing 1.5 of a recipe for this size crockpot? Hi Allison! 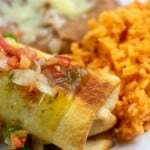 I haven’t tried doubling this recipe, so I’m unsure if it will fit in your crockpot or not. I don’t think the cook time will change regardless, though.